This article is based on the authors’ project ‘Islamic Morality and Challenges to Democracy: A Study of Urban Lower and Middle Class Responses’. Millions of Muslims descended upon Jakarta in December 2016 and joined with large numbers of the city’s residents in a rally called the ‘Action to Defend Islam’. The demonstrators demanded that then governor of Jakarta Basuki Tjahaja Purnama (better known as ‘Ahok’) be stripped of his governorship and put on trial for blaspheming against Islam in an off-the-cuff campaign speech. Ahok — who is now imprisoned — controversially commented on a Quranic verse that suggests Muslims should not appoint a non-Muslim leader. Ahok himself is a Christian and ethnic Chinese. This makes him part of a social group seen to have unfairly benefitted from colonial-era policies that allow for the concentration of wealth in their hands. The Ahok case shows a link between expressions of Muslim solidarity and resentment of existing socio-economic conditions. Such resentment is not exclusively held by poor Muslims — many Indonesians, especially the young and educated middle class, now feel let down by the promises of modernity and development that are instilled through educational and other institutions. Ahok’s controversial program of urban redevelopment (which involved mass evictions) accentuated the already strong sense of precarious existence that permeates through Indonesian society. Indonesians’ responses to their socio-economic circumstances are increasingly articulated through the language of religious morality, which reflects the growing levels of piety within Indonesian society and enables the sort of religious solidarity that was seen in the 2016 protests. This connection between socio-economic grievances and strength of religious sentiment has facilitated the emergence of a ‘market of morality’: a space through which Islamic symbols are consumed and reproduced as an expression of grievance against an unjust status quo. Islamic morality potentially provides a rich cultural resource pool for competing elites to exploit, including in many of the 171 local elections due to take place across the archipelago in 2018. Mass mobilisations of support may be expedited when required by the particular narrative of oppression that was used so well against Ahok in Jakarta. This narrative is one that emphasises the struggles of a perpetually marginalised and virtuous majority that are imagined as an ummah (community of believers). The ummah is contrasted against the ‘greedy’ business elites (typically the ethnic Chinese minority) who are in turn backed by corrupt and powerful political figures. 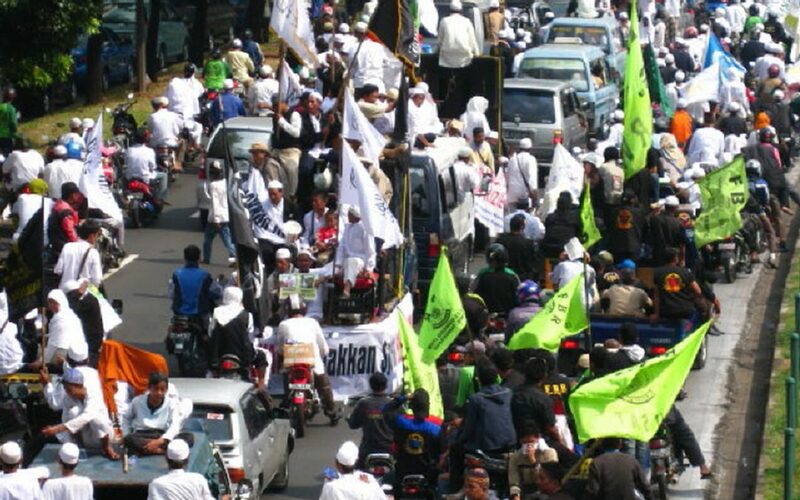 A survey of 600 people who participated in the ‘Action to Defend Islam’ rally sheds some light on the link between perceptions of social injustice, adherence to Islamic morality and political action among Indonesians. Reflecting the youthful nature of the protests, 60 per cent of respondents were in their 20s, 18 per cent were in their 30s and only 14 per cent were over 40 years old. A slight majority (51 per cent) had completed tertiary education while secondary education was the highest attained by 47 per cent of respondents. 44 per cent reported monthly household expenditures of 4.5–7 million Indonesian rupiah (approximately US$350–500), which places them in the lower middle-class bracket. While the anti-Ahok mobilisations of 2016 were spearheaded by hardline groups like the notorious Islamic Defenders Front and the now-banned Hizb ut-Tahrir Indonesia, nearly 60 per cent of respondents claimed affinity with mainstream Islamic organisations like Muhammadiyah and Nahdlatul Ulama. These organisations are usually held up as guardians of ‘moderate’ forms of Islamic politics in Indonesia. This simultaneous support for moderate groups and for actions spearheaded by hardline groups is not so surprising. When comparing those who veer toward moderate and towards hardline organisations, the survey results show little difference in adherence to opinions on many questions pertaining to Islamic morality. These include attitudes toward non-Muslims, the role of women in society and religiously acceptable economic activity. It appears that moderate Muslim organisations are perceived to be incapable of addressing Indonesians’ socio-economic anxieties, which is driving respondents to support the more assertive narratives of marginalisation deployed by hardline Muslim groups. Interestingly, one-fifth of the survey’s respondents felt that not one Islamic organisation represents their interests. This situation is helping hardline narratives to be pushed into the mainstream of Muslim politics (which was previously led by moderate Islamic organisations). These survey results do not reflect a set of social circumstances that have suddenly come into being. Since the late 1980s, the neoliberalisation of the Indonesian economy has eroded public institutions and increased competition between individuals in a context largely devoid of social safety nets beyond the family. Because the market is too abstract to be blamed, the most convenient scapegoats are ‘others’ who are defined as being firmly outside of the toiling majority. The Ahok case — which displayed strong anti-Chinese sentiment — shows that feelings of resentment towards market injustices can be smoothed over by the idea that the Muslim majority has been systematically marginalised in the competition over economic resources. It also shows that political elites are ready to take advantage of the socio-economic anxieties of young and educated Muslims. Issues of inequality and injustice in Indonesia are likely to be increasingly framed on the basis of racial as well as religious identities. This will only perpetuate the current neglect of how these issues are more fundamentally related to neoliberal transformations and the nature of economic and political power. Vedi Hadiz is Professor of Asian Studies at the University of Melbourne and an adjunct professor in Indonesia. Inaya Rakhmani is a lecturer in communications in the Faculty of Social and Political Sciences, University of Indonesia and an associate at the Asia Research Centre, Murdoch University. Dr Inaya Rakhmani is the Head of the Communication Researcher Centre, Faculty of Social and Political Sciences, Universitas Indonesia. Note: A version of this article originally appeared East Asia Forum at http://www.eastasiaforum.org/2018/01/05/marketing-morality-in-indonesias-democracy/. Image: ‘Political Protest in Jakarta’ is used under a Creative Commons licence from Flickr User SAGT.